Jarrell Properties, Inc. (“JPI”) learned from the Fredericksburg Area Alliance of a confidential industrial site search on behalf of a Confidential Prospect for an international firm’s regional distribution center that was to be located on the East Coast. JPI realized that the search criteria were a potential match for land owned by one of JPI’s affiliates: Coleman Family Farm, LLC. JPI submitted the Coleman Family Farm site for consideration and the site made the Confidential Prospect’s short list. The Coleman Family Farm site was in competition with sites from North Carolina to New Jersey, and the Confidential Prospect was offered significant grant packages by the various states and localities involved. JPI had to work with county and state officials to convince the Confidential Prospect that the Coleman Family Farm site along with the financial package was the best choice for their distribution center. Solutions: JPI entered into direct negotiations with the international based executives of the Confidential Prospect. Once a tentative deal was struck, JPI collaborated with the Virginia Economic Development Partnership, the Virginia Governor’s Economic Opportunity Fund, the Spotsylvania County Administrator, the County’s Economic Development Authority, the County’s Department of Economic Development and the County’s Zoning, Planning, and Utility departments to work to balance the needs of the Confidential Prospect, County, and JPI. As a result of these efforts, the parties were able to come up with some innovative solutions to the multitude of issues that arise in a project of this magnitude. The Confidential Prospect was Lidl, a German grocery firm that is one of the largest grocers in the world. 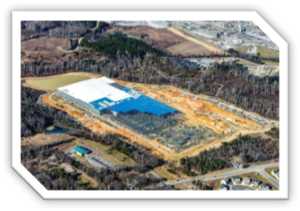 In July 2015, Governor Terry McAuliffe announced that Lidl had elected to build a 900,000 square foot, $125 million distribution center on the Coleman Family Farm property in Spotsylvania County, Virginia. JPI worked with Lidl and the County to get the development plans approved and the Coleman Family Farm property was sold to Lidl in July of 2015. The sale to Lidl has spawned additional interest in the Coleman Family Farm property, and JPI has recently entered into a contract for sale to an industrial firm at the site.